Our people are our greatest asset, and as such we believe that job-related illnesses and injuries are unacceptable. As Golden Star’s success hinges on our teams we strictly assess our health and safety performance using a variety of measures and our performance guides the development of our safety and health programs. To access the safety, health, and well-being policy, please click here. The safety and health of our employees remain paramount in all our decisions and our firm belief is that all employees should return home safely at the end of their work day. 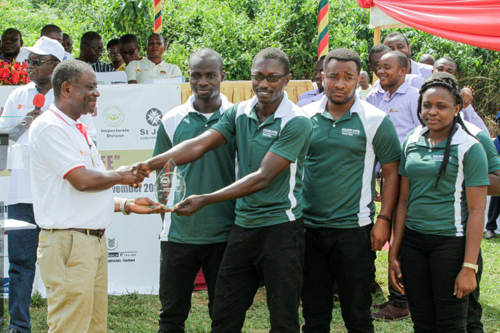 Golden Star’s Wassa mine was awarded the second prize at the National Mines Safety and First Aid Competition in Ghana in November 2016, having missed out on first place by a narrow margin. The team had previously won the competition for three successive years. Wassa’s Health and Safety Superintendent, Shamsudeen Sidi Adam also received an Excellence Achievement award for managing the Wassa team during its three years as champions. He was the first person to receive this award in the history of the event. In 2016, a comprehensive two year health and well-being plan was adopted. The health outcomes have been remarkable, with considerable improvements in fitness for work management, and medical diagnosis and treatment, resulting in improvements in employee productivity and overall employee wellbeing. Visit the Community page to learn more about our programs to enhance community health and well-being.